Most people know that bathrooms and showers, and occasionally steam rooms and saunas, are focal points in modern home construction. Bathroom design is critical in commercial construction, too, because these rooms are important for setting rental rates or attracting talent. Not so well known is the role chemists have played in making all of these rooms safer, cleaner and much more enjoyable for the people using them. From a design standpoint, the big feature that sets bathrooms apart is the copious use of plumbing, meaning large amounts of water must be controlled, contained and drained. Heavy water use in sinks, showers and toilets create opportunities for big problems, such as leaks, mold, mildew, rot and other forms of damage that often impacts more than a single room. Repairs can be costly, particularly in multi-level buildings and high rises. The good news is that water-based emulsion polymers will play a role in preventing many of these problems and others when applied correctly. Water-based styrene-butadiene polymers are widely used in this market because of their ease of application, excellent water resistance, high filler acceptance levels, and excellent adhesion to difficult substrates. All of these attributes work well for the wide variety of materials and labor skill found in the construction industry. Let’s look at an example. Ceramic tile installed in a shower is much more complicated than it seems, as a number of problems are to be avoided. The obvious problems are shower tiles falling off the wall or coming loose from the floor. Then there’s the potential for sagging. Maybe you’ve looked at your wall tile and realized that there are lines in the grout that aren’t exactly straight. What about tile material? If the designer specifies stone tile, such as granite or marble, and the builder uses a colored ceramic tile adhesive, the stone can stain. That’s because stone is porous and will absorb some of the adhesive over time. Glass, stone and ceramic tile all have different properties, and chemists must understand those properties to design effective tile adhesives that are formulated with emulsion polymers. Builders and industrial chemists also have to understand water properties and how water might get into places it shouldn’t. Improper tile installation – either in poor workmanship or choice of polymer products like adhesives and sealants – can lead to additional problems such as mold and mildew behind the tile where you can’t see, as well as in the grout, which you can see. Condensation can take place inside of wall cavities if steam passes through the grout, mortar and substrate to escapes into cold air, which could lead to wood rot and damage to drywall or insulation. 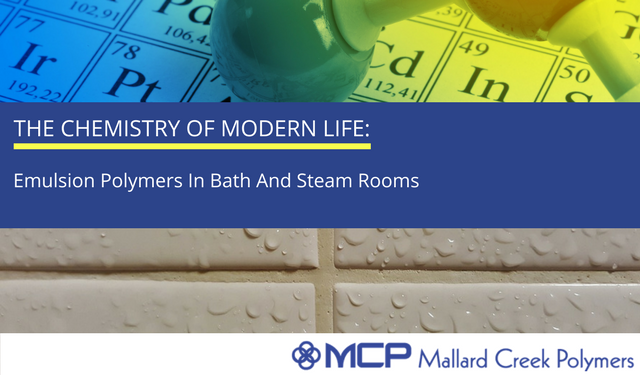 Because water and steam must be contained, chemists have designed liquid-applied membranes to create effective water barriers that cover tile and grout as well as in front of and behind cement board. The extra layers of water-proofing for substrates are necessary in high humidity environments, particularly steam rooms, because the walls, floors and ceilings in adjacent rooms can be adversely impacted by escaping water vapors. Styrene butadiene polymers (a.k.a. synthetic latex) are more than effective water barriers. When polymer formulations contain biocides or mildewcides, they are mold and mildew resistant. And tile sagging can be a real problem with inexperienced installers. If the set time is long, wall tiles that were installed on a straight and level grid can sag a bit – or a lot – before the adhesive fully sets. Polymer adhesives are designed with varying set times, and installers must know the products they are working with. Tack, shear, peel and tensile strength are all attributes of tile adhesives, and those attributes must be optimized for the application at hand. This article covers just one type of product commonly used in bathrooms, tile. The same effort that goes into making tile adhesives and liquid-applied membranes also goes into making sealers for plumbing and toilets, glazes for floor coverings, and paints for walls and ceilings. Anywhere you find building materials that need to be water-proofed, adhered, sealed, grouted, glazed, or painted, you’ll find water-based emulsion polymers doing work tirelessly.